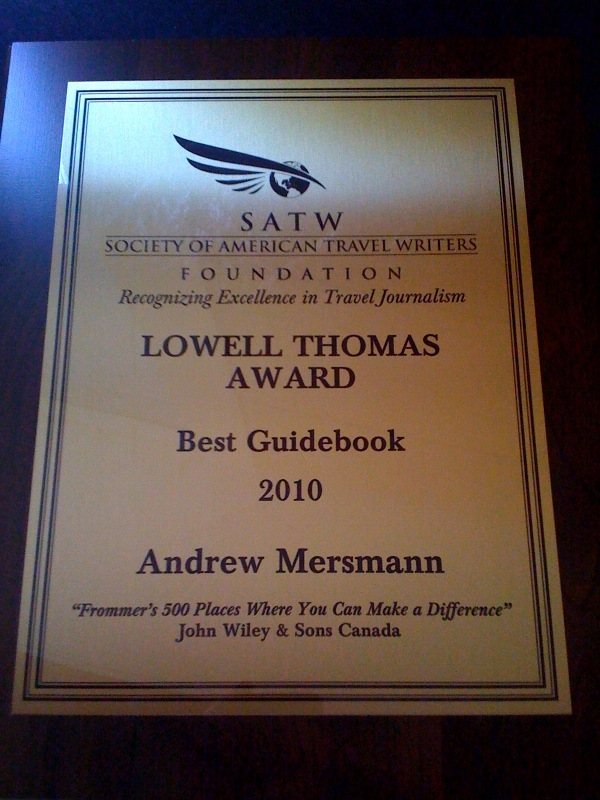 It was a bit of a Sally Field moment for me last night (You like me, you really like me), when I was presented the Lowell Thomas Gold Award from the Society of American Travel Writers Foundation for the “Best Guidebook 2010” for my book, Frommer’s 500 Places Where You Can Make a Difference. The award was unexpected (not a surprise last night, but it was a huge surprise when they informed me a few weeks ago) and a nice up moment on what has been a roller coaster of a year. You needn’t read my book to find a way to be of service…but find a way. Volunteer. Be bigger than you are, audacious in what you decide to accomplish, and unstoppable in your cause, whatever that may be. Here is an article at Frommer’s about six steps to planning your volunteer vacation. I was lucky enough to be asked for my two cents as Melinda Quintero put the piece together. Whether you’re looking to volunteer for an afternoon or for several weeks while on the road, organizations around the world are eager for your help. Don’t know where to start? You can plan a successful volunteer vacation by following these six steps. Integrating any amount of volunteer time into your next trip requires some research before you leave. But as countless volunteer veterans will tell you, it’s worth the planning. You can live abroad as a volunteer for an extended period of time through programs such as the Peace Corps (www.peacecorps.gov). However, traveling as a short-term volunteer has grown in popularity in recent years as more and more charities, non-profits, NGOs, and even travel agencies expand their programs to include appropriate work for a more casual visitor. In early 2010, even Disney offered a free day at a Disney park in exchange for a day of volunteer work with the HandsOn Network (www.handsonnetwork.org). 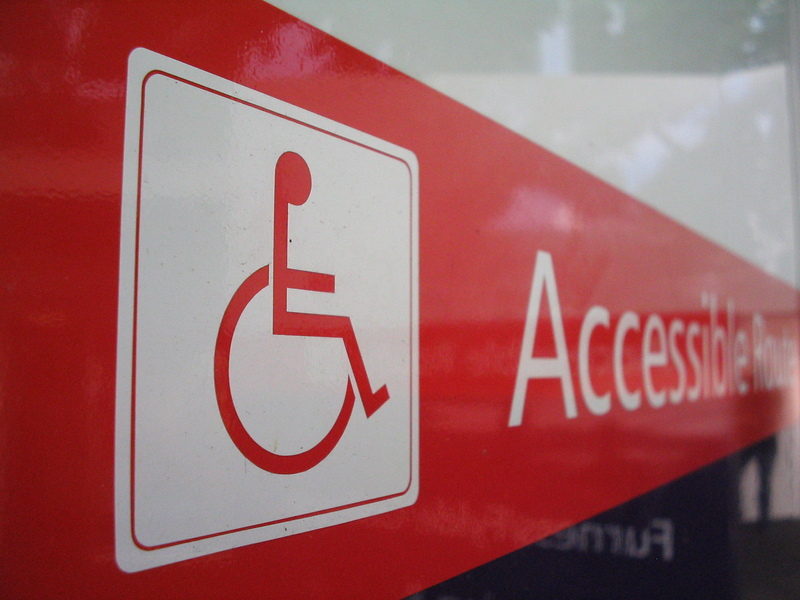 Today, July 26, is the 20th anniversary of the Americans With Disabilities Act, a civil rights law that prohibits discrimination based on disability and mandates access to places of business. Here is the volunteer opportunities page for Disabled American Veterans. Match-Up pairs volunteers with seniors with disabilities. Work and Volunteer Abroad has a whole category of international volunteering with those with disabilities. Of course, there’s a section in my Frommer’s book, 500 Places Where You Can Make a Difference, dedicated to volunteering with people with disabilities. The Adaptive Sports Center is one of many organizations around the country and world dedicated (with the help of hard working volunteers) to improving activity opportunities for the differently-abled. Volunteer Match lets you type in your zip code to find volunteer opportunities near you—use the keyword “disabled” or similar to refine your search. Then cross-reference and compare those results with the ones you get from United We Serve (serve.gov). Volunteer with Guide Dogs for the Blind or one of the many other organizations that trains service animals. Don’t stop here–let this tiny scratching of the surface be a springboard. There is something near to your location (at home and/or while on vacation) and there is also something near to your heart. Go out and find it. Well–here it is. This is the book that kept me on self-imposed house arrest all winter and spring, tilting at the windmills of time trying to get it done. It is now available at online retailers (Amazon.com, Barnes & Noble, Borders, etc) and I hope at your local bookstore as well. I love local bookstores and hope you’ll patronize yours (they are a disappearing breed). I hope you’ll want to pick it up and thumb through it, maybe find something that catches your eye, sparks your imagination. If you do, let me know what you think. And especially if it serves as a tool for you to plan some travel and go out there determined to make a difference, please please let me know that as well. It would mean the world to me to know that. SO this is my 100th posting since I started the blog. Below is a brief piece from a summer issue of Marie Claire Magazine in their “World Reports” section, about volunteer travel, with a brief quote (all that’s left from a longer interview–but I know too well, from the other side of the equation, how that goes and interviews get cut down to bites) from me and mention of my book, at the end. It is the first time (to my knowledge) that the book has been mentioned in editorial content in print…so I’m kinda jazzed. A direct link is (here). Angelina Jolie helps build a hut for Congolese refugees in Tanzania. You tumble out of your bunk at 5 a.m., take an ice-cold shower, and schlep banana-tree trunks across the rainforest to build a bridge. That’s called summer vacation for volunteers with the Malaysia-based Great Orangutan Project, which works to protect the dwindling population of red-haired apes. And it’s one of hundreds of do-goodery options for people itching to heed President Obama’s call to service, asking not what your time off can do for you (tan lines, hookups, tiki bars), but what you can do with your time off. A slew of “voluntourism” books are hitting shelves this summer, starting with Volunteer Vacations Across America and National Geographic’s The 100 Best Volunteer Vacations to Enrich Your Life. The guides describe how to do everything from building a mobile karaoke studio in Cambodia to restoring a monastery in Tibet.